An extract from a long account appeared in Ballinrobe’s The Bridge Magazine c. 1969 in which it states that four occupants of the leading car died instantly, Sergt. O’Regan, Constable O’Regan, Const. Power and Const. Oates with two others on the lorry being injured, Constables Flynn and Morrow and they returned to Ballinrobe for assistance. The official version from Military Headquarters, Dublin is also given where it states that “12 rebels were either killed or wounded. The body of one rebel was recovered. A man armed with a shot gun was captured, one military officer severely wounded”. The account goes on stating that the dead body of a young man named Feeney, said to be a native of Ballinrobe was taken to Castlebar Military Barracks. It is also stated that there were three civilians arrested. Mr Kierans states “this account was hardly very accurate”. Taken from "Dilseacht, the story of Comdt. General TOM MAGUIRE and the Second (All-Ireland) Dáil" By Ruairí Ó Brádaigh. This page was added by Averil Staunton on 31/01/2012. Thank you to everyone that has posted comments on this page. 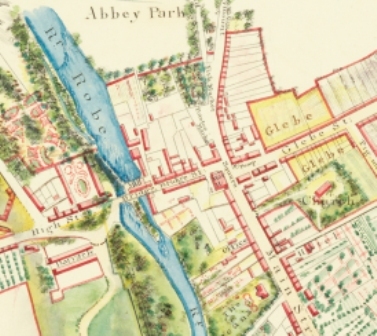 I am the great niece of Tom Maguire and am currently working on my family history and am struggling to find a lot of variety in the information that is available. My grandfather, Lawrence Keane, was from Drimcoggy and participated in the ambush. He told us that he assisted in holding townfolks in O'Toole's and and one of his brothers were chased in the Party Mtn afterwards. I recall as a child him telling me that his friend came down out of the mountains and was shot and killed by the Tans. He told us he was a volunteer in the South Mayo Bridage, although he is not in the picture. We have relatives (Peggy Conway) still living in Drimcoggy and in Ballinrobe and Westport. His father, Patrick, is buried in the church cemetery in Tourmakeady. He came to American through Toronto into Detroit where another brother Thomas was living. He then came to Brooklyn NY and met his half-sister Nancy. He settled in Brooklyn, married and had 8 children my father Thomas being one of them. My grandfather's contribution to Irish freedom is an immense source of pride for our family. Terry O'Brien was my great uncle, his younger brother Patrick being my grandfather. He went on to join the south battalion in the late 20's and on his passing aged 90 made him the last of Maguires men. Another relative Terry and Patrick's cousin was Seamus Burke whose name is in the constitutional law books for the habeas corpus action he took in 1939. Patrick also called one of his sons(my uncle) Terry. Reply: Thanks for adding more information about this article. Dia Dhuit - Would anyone know what townland no 9 - Tom Lally hailed from? My ancestors, the Walsh's of Derrindaffderg had relations who were Lally's so there may be a connection. I had seen this photo before but never knew it was taken in Moorehall, so I was delighted to learn that Thank you James Dooley. I would be delighted to learn any other stories from that period with a Derrindaffderg/Killawalla connection. Go raibh maith agat. Jason. BÁC. Hello, all: My grandfather was Terence Francis O'Brien (#7) of Ballinrobe. I'm researching my ancestry and have been told that after the Troubles, he escaped from prison (do not know why/by whom he was imprisoned -- Free State?) and the family apparently did not discuss him further. However, he came to New York City (1925), married my grandmother Anna McGiff (1928) and had three children, one of whom was my father Terence Patrick O'Brien. I see a prisoner number for him listed above, and would greatly appreciate any additional info or details about his circumstances. No.1606 was Terence O'Brien's number in prison in 1922. My mother (his sister) had lots of momento from his time in jail but as kids we destroyed the them. I wonder if the original photograph is still around?......I hope so! The middle photo volunteer no.21 John Ferguson is armed with the new 'quick firer' Thompson sub-machine gun, which were arriving to the IRA from May 1921. They were seen at the Truce period training camps in Autumn 1921. IRA photos of this gun at that time period are pretty rare. 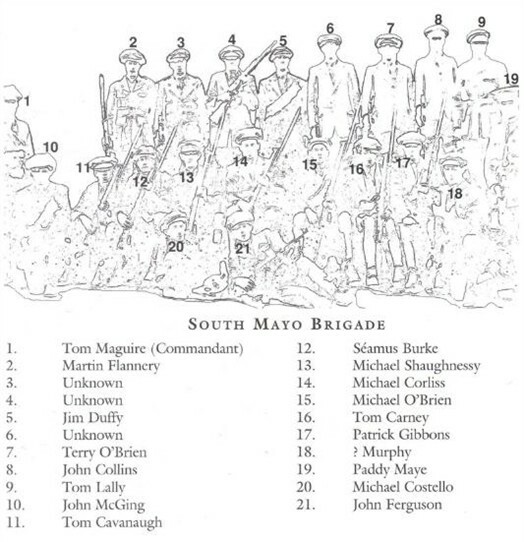 The space between Tom Maguire and Mattie Flannery was left for their fallen adjutant, Comdt. Michael O'Brien (The suggestion coming from Tom Maguire). This list was prepared by Lt. Seamus O'Brien (owner of the picture) on 30th of December 1964 and a copy was lodged with the Convent in Ballinrobe. In 1970 my uncle, the late Luke Higgins who had a fantastic collection of antique firearms and he gave me a present of my first shotgun. It is a Winchester model 1894 short barrell pump action, commonly known as a riot gun. Luke told me that the gun had been captured at the Tourmakeady ambush. The number RIC 387 is engraved on the stock. I have had many a good dinner of snipe, woodcock and other from that present. Currently the gun is in storage with a dealer. I would very much like the names of the men in the photo - those that are 'Unknown' and any corrections. I am confident that if you were to post them James, they would be very much appreciated. Thank you. Your information about this photo is in correct! The photo was taken well after Adj. Michael O'Brien was shot... No. 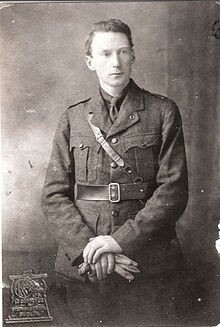 15 is in fact Lt. James O'Brien (Kilmaine) who took part in the ambush and the subsequent action on the mountain - it was he who shot the British officer who killed Michael O'Brien. I can supply the correct name of every man in that photo, if you'd care to correct it. 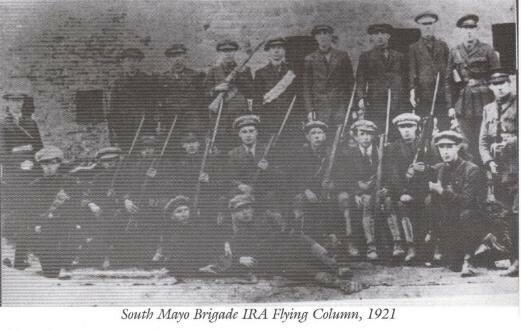 There is no doubt that an ambush on a RIC/Black and Tan re-supply patrol took place on the 3rd May 1921 in Tourmakeady, Co. Mayo with the ensuing action on the Partry Mountains overlooking Tourmakeady. The fact is that four policemen/Tans were killed and that two were injured. According to another commentator, a variety of versions as to what actually happened on the Partry Mountain have appeared over the years. The IRA commander, Comdt. Tom Maguire (1892-1993) claims that he was surrounded by 600 British troops and that after a daylong fight he managed to bring his Column to safety inflicting up to fifty casualties and suffering one killed and two wounded (including himself). Whatever numbers are correct it must be remembered that his mission to kill or destroy a RIC/Tan patrol, that was supplying Derrypark police barracks, was successful. Derrypark barracks was closed on 5 May, 1921. This inaccuracy of figures was not limited to I.R.A. veterans - quite a number of British accounts of barracks attacks and ambushes by the I.R.A. are just as economical with the truth! They say the first casualty of war is the truth! We should bear this in mind when writing and reading about the period.